If you want an easy way to help your marketing team produce better content, cancel a meeting. Better yet, cancel your first meeting of the day. Studies have shown how lapses in productivity often trace back to an overabundance of team meetings. Schedule a status call for first thing in the morning, and a content marketer’s creative juices are virtually guaranteed to stop flowing. Take a quick look at your calendar for the coming week. How much empty space do you see? If it’s minimal, you could be unintentionally making it difficult for members of your content team to produce their best work. Content marketing involves a lot of moving parts, from strategizing and planning to creating, analyzing, and promoting. Each process is highly involved and requires a lot of brainpower. Much of it warrants high-level discussion. You can’t achieve higher conversion rates or increase your email ROI if your team isn’t united around a common vision and goals. However, at some point, content creators need uninterrupted time to research, think, and create. And this is where problems can surface. As a marketing manager responsible for proving the bottom-line benefits of content marketing, it can be tempting to rely on recurring team meetings and regular check-ins to keep your finger on the pulse of projects and progress. But when meetings evolve into habit, their value tends to plummet. A Harvard Business Review article details how one weekly meeting drained a company of 300,000 work hours every year. VoloMetrix research outlines how easy it is for a company of 20,000 employees to waste $300 million on useless meetings. Still other research contends that companies lose $37 billion annually to unproductive meetings. True. But that doesn’t mean we’re in the clear. Something as mundane as a weekly strategy session has the potential to do real damage. To see how this applies to the realm of content marketing, let’s take a quick look at a hypothetical example. Adam is a great senior content specialist. He’s smart, talented, and full of big ideas. It’s 2:30 p.m. Thursday. Adam’s been working all week on a new campaign. He devoted several hours to researching, brainstorming, and scoping a potential project – and now it’s time to share his ideas via videoconference with his three-person content marketing team. Thirty minutes into the meeting, everybody’s on board and responsibilities have been divided. By Monday morning, the new initiative is in full swing and everybody’s devoting their most productive hours to prepping for launch. If the average team member earns $100 an hour in wages and benefits, the 30-minute Thursday meeting cost the company $150. Now compare Adam’s story to Molly, who has identified a need for an initiative to re-engage lost leads. She, too, works in a three-person team whose members earn the same wages and benefits as Adam’s group. Molly hasn’t done any research yet, preferring to wait and talk through her half-formed ideas with two colleagues at this week’s strategy session. Hers is one of three ideas to discuss, which takes an hour. Afterward, an ensuing barrage of follow-up emails and group chat turns the one-hour meeting into nine hours of cumulative work. Thus, the total cost of Molly’s meeting is $900 – a 500% increase over Adam’s 30-minute meeting and zero-related email chains. The cost difference is not even the biggest issue. Each time marketers are pulled away from creating content to discuss content creation, they inevitably lose a dose of productivity. One study says it takes 23 minutes, 15 seconds to get back on track after a work interruption. NeuroLeadership Institute Director David Rock explains that these shifts in focus can cause people to make mistakes, forget good ideas, and lose valuable insights. That’s not to say you should avoid meetings at all costs. Some meetings are crucial for driving your content strategy forward. Interviews with customers or clients, quick calls intended to replace 25-deep email chains and regular one-on-one meetings all serve valuable purposes. You should be selective by differentiating between meetings that add value and ones that hold your team back. And you should make the meetings you do hold worth their weight in gold. Let’s take a look at how to do that. First, assess the role meetings play in your content strategy and development processes. If your team uses a shared time-tracking tool, pull those numbers into a spreadsheet. Then sort the columns to total the hours per week attributed to meetings. Or ask each team member to calculate and share his or her results. Did the content team already spend time thinking about the issues being discussed at the meeting? Was the face-to-face conversation needed to move forward on an important project or issue? Did people walk away from these meetings with actionable next steps? Do the issues at hand in the meeting have a direct impact on the content marketing strategy? If you answer “no” to any of these questions, there’s a good chance the meeting is no longer needed. This is the most difficult, and likely the most intense part of the process. Once you’ve identified recurring content marketing meetings that need to go, take back those valuable productivity hours. If you haven’t identified a single meeting to eliminate at this stage, you’re either the poster child for productivity or you’re in denial. For example, do your content creators still brainstorm together? If so, here’s some food for thought. Studies show that too much data from too many people can be disabling. One of the first modern psychology experiments to test the effects of group brainstorming evaluated how effectively a group of four brainstorms to solve a problem versus how one person devises possible solutions. Ninety-six percent of participants produced more ideas when they worked on their own, often at a higher quality. The evidence from science suggests that business people must be insane to use brainstorming groups. If you have talented and motivated people, they should be encouraged to work alone when creativity or efficiency is the highest priority. If you aren’t on the group brainstorm wagon and still haven’t identified a single meeting to eliminate, there’s one last option to consider – experiment with a no-meeting policy. For example, Asana bans internal meetings on Wednesdays unless it’s absolutely necessary. The goal is to give managers and team members more disruption-free time to focus on work. One of the saddest mistakes in time management is the propensity of people to spend the two most productive hours of their day on things that don’t require high cognitive capacity. If we could salvage those precious hours, most of us would be much more successful. Set a time limit – If you’ve heard of Parkinson’s law, you know work tends to “expand to fill the time available for its completion.” Later iterations (or correlations) of this scientific theory have essentially flipped it to say that work contracts to fit the time given it. Or, considered from another angle: Meetings expand or contract to fit the time scheduled. Book a meeting for an hour, and your content marketing team is likely to fill the hour. Constrict it to 30 minutes, and there’s a good chance you’ll cover the same information – minus the chitchat – in half the time. Another benefit is that meeting participants will get more out of the shorter meeting. Social scientists have proved that the human brain is wired to pay attention and absorb information for 10 to 18 minutes before it begins to tune out. In simpler terms, people mentally check out of even a well-planned meeting if it goes too long. 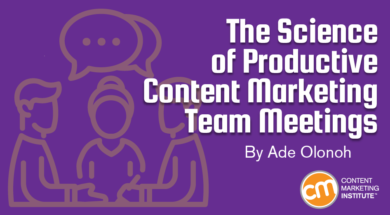 If you’re looking for a way to make your content marketing team more productive, be deliberate about the meetings you hold. Taking a strategic approach to team meetings can yield some amazing results when it comes to creativity and output. What about you? I’d love to hear your tips for making content marketing meetings matter. Please share them in the comments. Want to make better use of your own time? Subscribe to the CMI weekly newsletter for a digest version of the daily email. Ade Olonoh is on a mission to help make better managers. As founder of Jell, he’s passionate about topics related to team communication and productivity. Follow Ade on Twitter at @adeolonoh.